To see an updated version of this post, go to Happy Gnoming. I saw this on Pinterest one day and pinned it to a board and forgot about it. But I noticed it the other day and decided to make it. 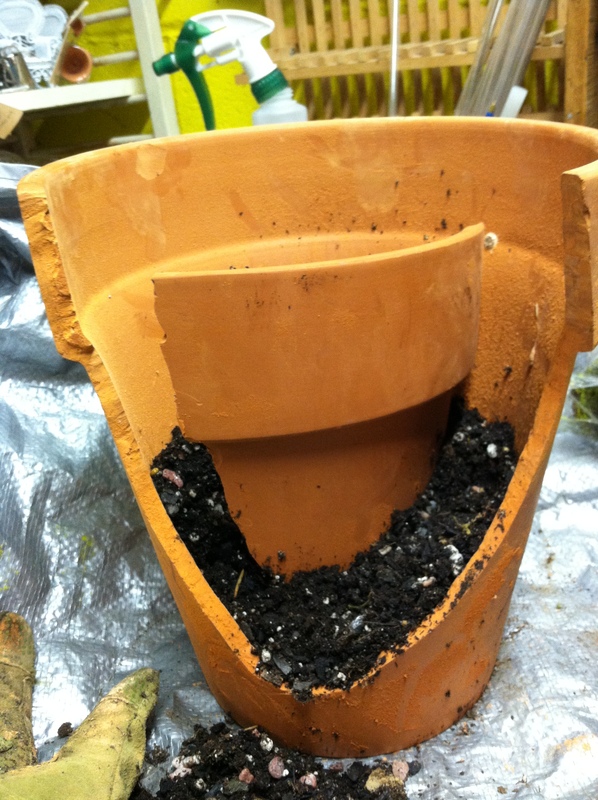 It was harder to do than I thought because cutting a terra cotta pot is not easy. 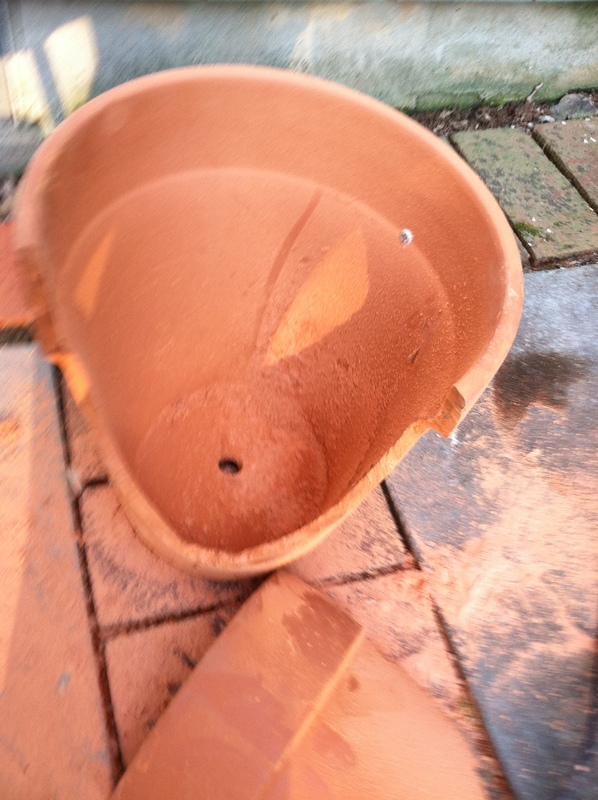 So easy to shatter and crack, terra cotta is extremely hard. 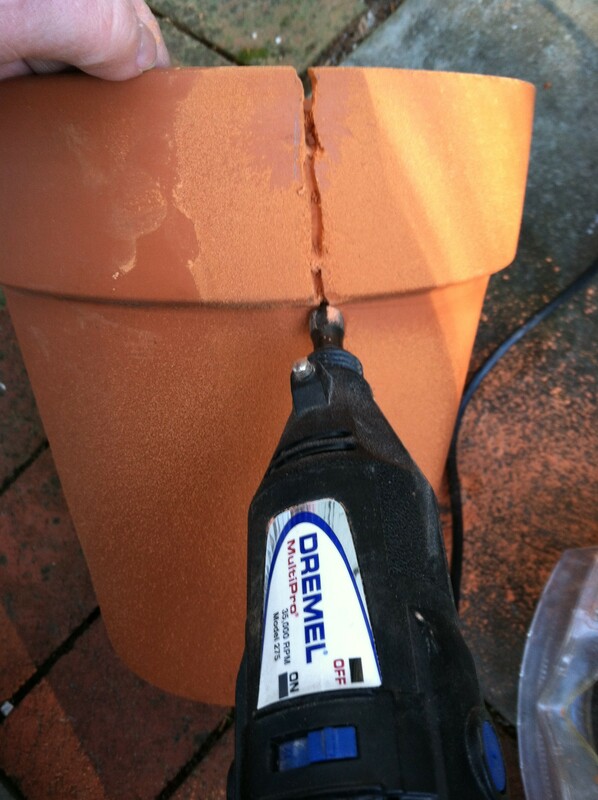 I had a dremel, an electric cutting tool available at Home Depot, and thought that was the best way to go about it, but wasn’t sure. So, I called the 800 number on the Dremel web site and they were very helpful and recommended using a carbide tile cutting tip, which worked like a charm! I did it outside because of all the dust it threw out, and wore goggles and a face mask. 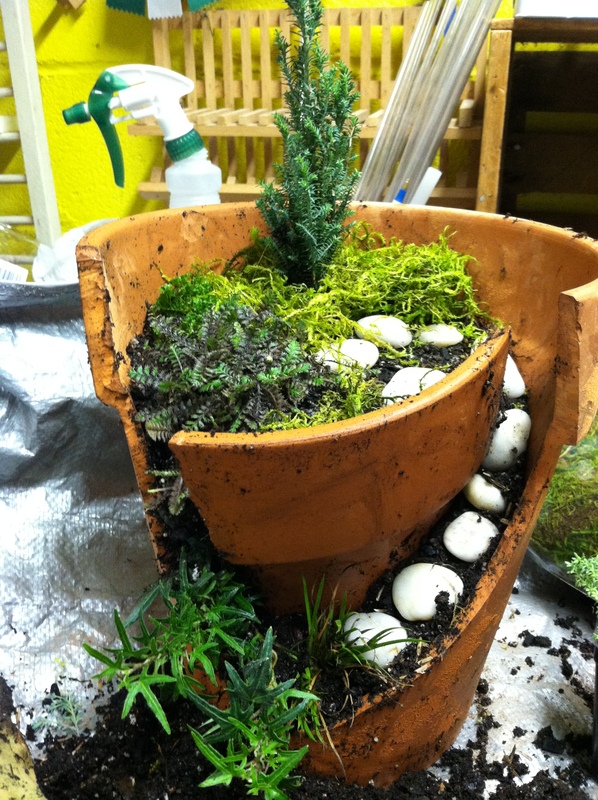 Also, I soaked the pot before cutting to soften it a little. That’s just the cutest thing. Congratulations on making a PINN. I’ve got sooooo much on my board I could be crafting for the next century, HA. You did an awesome job. 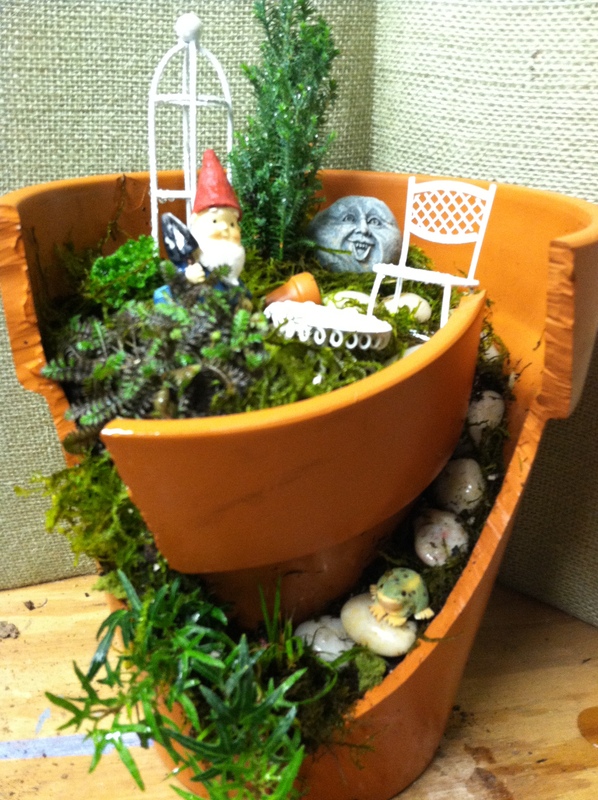 Thank you for linking back to my Gnome stories too. Awfully nice of you . My sister-inlaw is a florist as well, our families rather addicted. My brother has a gorgeous back yard. Good luck in Philly. 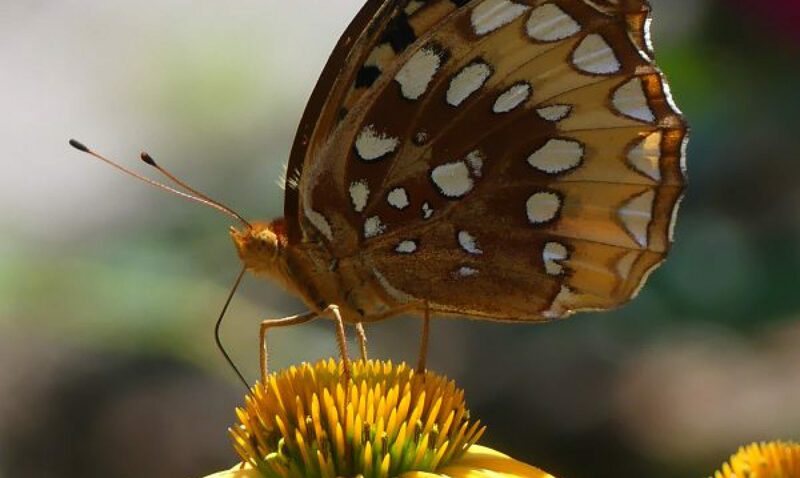 Thanks, I am going to post more of my gardens that I take there to show. 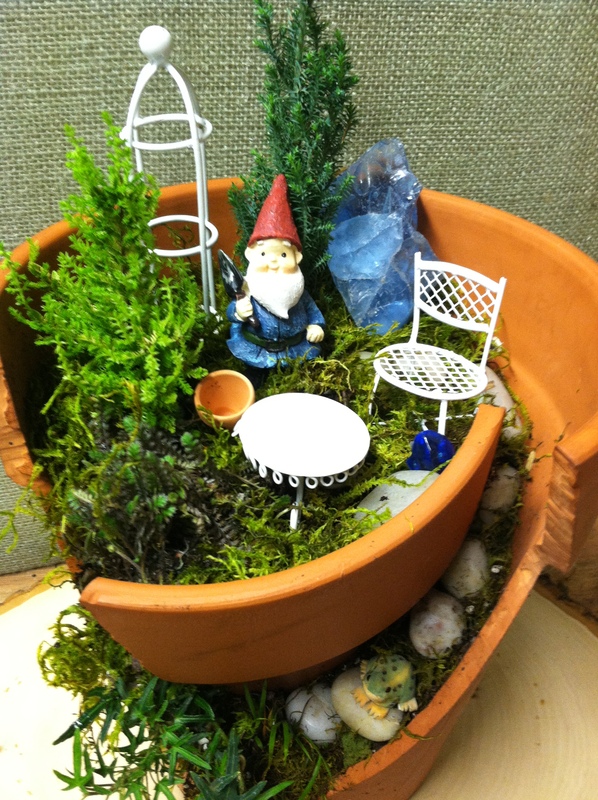 Where Can I find the round gnome house with the cone shoe roof ? I got it at this web site, http://www.fairyhomesandgardens.com/resin-cottages/, but am not sure if they still carry it. I am curious as to where you picked up the link to my post? I am getting lots of hits all the sudden and am not sure where people are picking up the link. Thanks for you help!